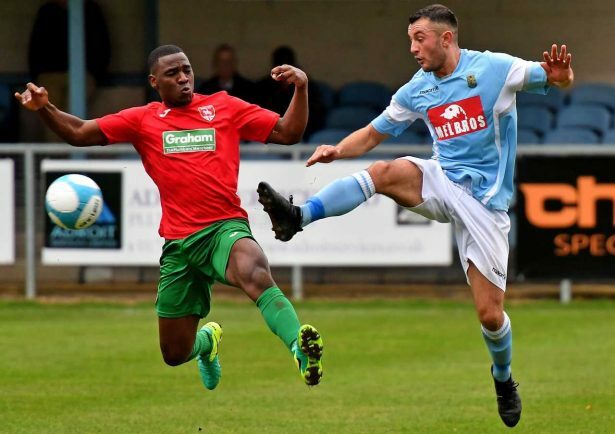 FOOTBALL: AN extra-time penalty miss by Bromsgrove Sporting’s Sam Wills meant Coventry United forced a replay in the fourth round of the FA Vase. The two sides battled it out again at the Butts Park Arena last night (Wednesday) after the Observer went to print. Jason Cowley gave Paul Smith’s men a 28th-minute lead but Jack Jeys forced extra-time after levelling eight minutes after half-time. A string of fine saves from United keeper Richard Morris kept the visitors in the game who had to defend doggedly after substitute Ryan Prinzel was sent off in the 106th minute. Sporting dominated from the very start with John Pykett seeing an early volley pushed behind by Morris before an acrobatic overhead effort by Jason Cowley flew agonisngly wide of the far post inside the first quarter of an hour. Goalscorer Jeys was next to see some mid-air action as his volley from inside the area from Brad Jones’ cross went over. After Morris then denied Sean Brain, there was nothing he could do eight minutes later as Cowley finished off a fine flowing move to nose Sporting ahead. A sweeping crossfield pass found Pykett on the far side whose low cross into the area was left by Brain, which allowed Cowley to force a save out of Morris before tapping home the rebound from a couple of yards out. The Rouslers continued to press but a slight error at the back from Guy Clark almost let Jeys in to nick an equaliser but he could only fire his shot wide of the far post. But United’s N0.10 was not to be kept out as he eventually got on the scoresheet eight minutes after the break. A simple long ball upfield allowed Jeys to nip in behind and with the onrushing Reece Francis well off his line, the striker stroked the ball home to grab what looked an unlikely equaliser. Although United were under the cosh for large parts of the game, Francis had to pull off a smart save at his near post to deny Mitchell Piggon from lashing home 13 minutes from time. There was always the feeling that another goal was coming and with five minutes to go the woodwork came to the rescue of Terry Anderson’s United side as Wills’ curling effort rebounded off the inside of the far post. Cowley then failed to divert at the near post from an Aaron Roberts cross as the game went to extra-time, with Sporting feeling aggrieved they were not awarded a penalty after appeals Bobby Moseley handled the ball in the area on two separate occasions were ignored. Little happened in the first half of extra-time but as the game entered the second period things became a whole lot harder for United after Prinzel was giving his marching orders for a late challenge on Max Loveridge. And six minutes later Sporting had the prime opportunity to level when they awarded a penalty after Cowley was fouled in the area. But Wills slipped at the vital moment of contact and his effort flew wide of the post. The hosts continued to press but United managed to stand firm to secure a replay at the Butts Park Arena.